It's amazing how the Harry Potter movie actors have grown on me. I keep on keeping a tab on their latest movies, hoping to see them portray new characters, and being an effective actor as they are I couldn't really associate them anymore to the characters that first brought them to fame. One of the most talented in the Harry Potter trio is Daniel Radcliffe himself. His career has skyrocketed landing him to some TV shows, stage plays and other numerous projects. 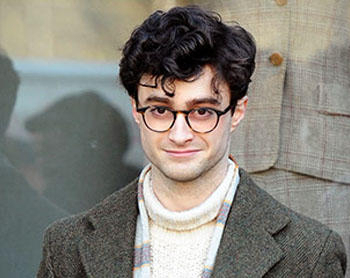 One of those movie projects he is part of is Kill Your Darlings, which will premiere in Italy this year. Watch the new 30-second teaser trailer of Kill Your Darlings, starring Daniel Radcliffe, Michael C. Hall and Ben Foster. While he is attending Columbia University in 1944, the young Allen Ginsberg's life is turned upside down when he sets eyes on Lucien Carr, an impossibly cool and boyishly handsome classmate. Carr opens Ginsberg up to a bohemian world and introduces him to William Burroughs and Jack Kerouac. Repelled by rules and conformity in both life andliterature, the four agree to tear down tradition and make something new, ultimately formulating the tenets of and giving birth to what became the Beat movement. On the outside, looking in, is David Kammerer, a man in his thirties desperately in love with Carr. When Kammerer is found dead, and Kerouac, Burroughs, and Carr are arrested in conjunction with the murder, the nascent artists' lives change forever. Kill Your Darlings will hit select cinemas on October 17, 2013.